Caution: contents may be hot. John does what you tell your kids not to do; take small machinery apart and put it back together again all wrong. John Morton, composer, instrument builder and grown-up, however, works magic by doing so. Here he probes into the intriguing and peculiar realm of the re-configured music box in his new CD, Solo Traveler. Following his sleeper hit, Outlier, also on innova, Morton’s new compositions are a surprising mixture of transparent simplicity and intricate multi-layering of timbres, melodies, and rhythms. He is joined by fellow composer Miguel Frasconi and the vocal ensemble Dare to Breathe. Among the pieces on the CD is the title track, Solo Traveler, a setting of Cynthia Nadelman’s poem scored for the unique instrumental combination of voices and music boxes. Teetines, a collaboration with Miguel Frasconi, plumbs the timbres and interlocking rhythms of “tined” instruments: music box comb, mbiras, and toy pianos. The ornithological-inspired work, Ta-wee, a solo work for music box comb (plucked with fingertips) and Through the Wall for motorized music boxes and piano wire (pulled through holes in the music boxes) are a weaving of sounds that surround the composer in his studio in Rockland County (NY) and are sound-processed using Max/msp. The CD’s final work, post-9/11 Amazing Grace Variations is performed on Morton’s music box instrument; a set of 17 recomposed and altered music boxes. For the past several years, John Morton has focused on the manipulation, alteration, and electronic processing of music boxes. Along with artist Jacqueline Shatz, he has constructed large-scale music boxes using multiple, moving sculptures and numerous re-composed music boxes, as well as outdoor sound sculptures. Besides performing in concert on his music box contraptions, Morton has created site-specific works including a music box sound installation for the Hudson River Museum. He is currently working on Sonic Hudson, a sound installation for the Piermont, NY Library funded by the New York Music Fund. Lullaby gamelan? Morton deconstructs music boxes and constructs music back with them. The first track tacks on mbira and we get quick swipes of the combs, full of tiny majesty and more recognizable music box action. Track two, the title piece, features voices more prominently in a swirl, nearing rounds at times circling perhaps to approximate the path of the dragonfly of which they sing. “Ta-Wee” is a music box in space, feels like satellites eavesdropping at the beginning winds up in a computer whorl. Similarly, the music box pattern on “Through the Wall” sounds like a gyroscope oscilloscope gradually overlays it…less mindfully mingled than on “Ta-Wee.” Maybe that is intentional. Then the piece de resistance, “Amazing Grace Variations” at 16 1/2 minutes, it is no less than amazing, from its plaintiff beginnings which quickly get corrupted and triple-lapped, then in comes an injection of electronic fervor. Quite a jolt, the music boxes then ricochet through loops and and deep listening phases where you can almost feel the music box clicking through…these get dampened in wave and in moisture it seems, heavy processing for a phase, if the listeners once was lost, now that listener is lost squared. More electronic reign…leading to icy drones that sound like bagpipes made out of ice…then when all hope is almost gone, very mangled remnants of the melody slowly clink out, there’s almost a bachelor pad phase that comes up after that until finally at last we return to our original state of “Grace.” Pretty weird in a good way, the album overall avoids being a one-trick pony by way of Morton’s e-processing. There are two extremely important details about this recording which prevent it from being a novelty gag and turn it into something very special. The first consists of the fact that John Morton does not just “play” music boxes, he builds them. Or to be more precise, he constructs entirely new instruments from them, which leave some of their original characteristics in place, while taking them into new directions and sound spaces. Morton does not simply want to use them for cheap source material – he is interested in their inherent musical qualities and “Solo Traveler” is testimony to that. We all have our “Music Box Experience” from our childhood and even though they may easily appear to be antiquated anachronisms or plainly out-dated, they have held their own in technological times and amidst a world increasingly speeding up. In fact, they seem to be on a small-scale come-back, at least over here in Germany. This has to do with two things: Music boxes are circular in their construction and their artistic content and as long as the wheel keeps turning, it will play its segment, the snake head of its end biting the snake tail of its beginning in a rotating embrace of harmony. As everything around us moves in linear ways, this constitutes a welcome continuity and a notion of eternity. Secondly, the simple harmonics and reduced timbre of the music box are the most comforting sound imagineable. In your heart of heart, you know it is an illusion, but this sweet tinkling really makes you feel as though you’re not alone and that someone cares. Morton makes use of both qualities to great effect. In his scores, the music boxes take on various meanings and functions, but they are always “open”, never obstrusive and aggressive, but always gentle and flowing. On the opening “Teetines” (a collaboration with Miguel Frasconi on Mbiras and Toy Pianos) and on “Through the Wall” (which includes some piano wire manipulations), the original sound of the music boxes is still clearly intact and at the center of the action: Chains of charming chimes turn and turn in a bellistic heaven, forming the clouds on a blue sky into funny shapes and animals. The “Amazing Grace Variations” take the melody of that piece and bend its pitch and rhythm into unrecognisable, but never alien regions, returning to softer waters in regular intervals. On each of these compositions, the music boxes are reprocessed in the studio, subtely altering their tonal characteristics over the course of the work and adding a further dimension without sacrificing the warm nature of the sounds. The only exception is “Ta-wee”, which has a more electronic feel to it, with bubbling chromatics pouring in from all corners. Central to understanding this album, however, is its title track, a joint venture with the “Dare to Breathe” vocal ensemble, which goes beyond genres and styles in its free-form associative flow full of mesmerising harmonic conjunctions. Here, the music boxes are placed more in the background, but by magic accord, their contribution always seems perfectly adjusted to the singing. 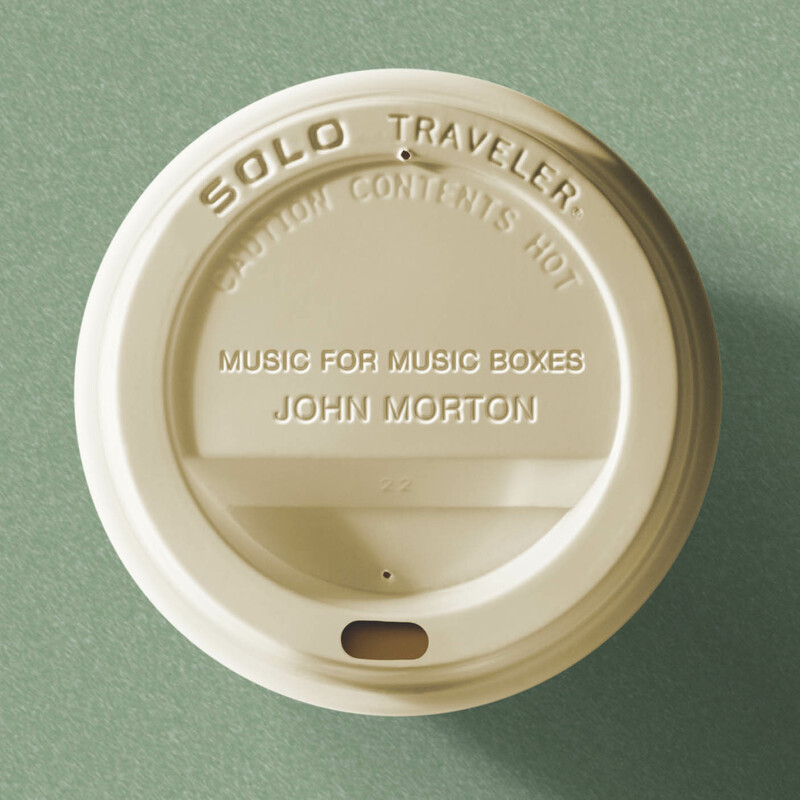 Which marks the second important detail of “Solo Traveler”: John Morton not only builds Music Boxes, he takes them out of the confined space of neverchanging cycles and plays them in a highly musical way. As much an engineer as a composer, John Morton Reconfigures old music boxes in the grand manner of Cage, Nancarrow and Partch, altering their mecanisms, redistributing their combs to create new clusters of melodies and rhythms. Their range and effect are then further extended by the skilful application of sound-processing software [...] There's a lot to be said for travelling light. Avant-garde composer John Morton was born in 1954 and grew up in Los Angeles. He was the son of Arthur Morton, who primarily wrote orchestrations for film and television music, but also worked as a composer, for instance writing the theme and music for The Waltons, and as a child Morton heard him working at home. He played piano and trumpet, but didn't get serious about music until he dropped out of college and began studying with David Scheinfeld in San Francisco. Returning to school, he attended the California Institute of the Arts in Valencia and studied with Morton Subotnick. After finishing, he moved to New York City in 1978. There, while working in a bookshop, he looked for opportunities for his compositions to be heard, and found them initially in loft concerts with friends. He experienced a creative breakthrough when his wife, sculptor Jacqueline Shatz, persuaded him to help her create a music box sculpture. He began disassembling music boxes and rebuilding them in different configurations, then creating compositions to be played on them. He started to gain greater recognition and was commissioned to create a work by the Greenwall Foundation that became "A Delicate Road," a collaboration with choreographer/dancer David Appel, which was given its premiere at the Kitchen, a performance space in New York, in September 2000. In the summer of 2001, Morton was artist-in-residence in the Arts/Industry Program at the Kohler Factory in Sheboygan, WI. On July 1, 2001, Innova Records released his first album, Outlier: New Music for Music Boxes, including "A Delicate Road" among other compositions. Solo Traveler: Music for Music Boxes, followed in April 2007. Quella di John Morton è arte di ingranaggi in movimento in assenza di stridori. Sottili lamine metalliche in libera vibrazione, autoprodotte ed estirpate a forza dal proprio inconscio, gioco di magici incastri luminosi; un panorama sonoro consacrato al concetto di risonanza. Compositore atipico, costruttore di strumenti, Morton, con il suo lavoro certosino, può esser affiancato (senza sbagliarsi più di tanto) all'espressione aliena e febbricitante di compositori trasversali quali Harry Partch, Conlon Nancarrow e John Cage, la magia tribale dei Gamelan indonesiani e le nubi trasparenti di “Music For 18 Musicians” di Steve Reich. Music box celestiali, manipolate ed alterate, spesso trovate lungo i bordi di una ricerca continua, azionate manualmente od in modalità meccanica, il risultato ottenuto, sempre nei paraggi del più puro stupore a bocca aperta. Risonanze infinite, composizioni che si muovono nei pressi della materia sogno, un'alternanza continua suono-silenzio, che lascia letteralmente allibiti. Una delle uscite più intriganti per la Innova, classificarlo sotto la sigla sperimentale, è tentativo fuorviante e maldestro di catalogarlo. L'aggressione è un concetto assente da queste parti, semplicità, trasparenza, stratificazioni timbriche gentili, melodie e ritmi da bolla di sapone trafitta da raggio di sole; questo è quello che troverete dentro questo prezioso lavoro. Ascoltarlo in una giornata calda, prima del morso del caldo; è esperienza inebriante. Ascolto/stupore/ascolto/stupore. John Morton's music is fresh, fearless and outrageously original. The thinking man's music box. For anyone who has the interest in the direct results of simply overlapping events and letting the phases work out relationships on their own, and the less direct results of manipulating both circumstance and outcome, John Morton’s Solo Traveler will fit in nicely beside the works of Nancarrow. Not nearly as limiting as the description might lead you to believe, this spring driven thing proves itself capable of all manner of variation and intriguing clockworks. Alternately sounding like a vast collection of kalimbas and mbiras—or the soft tines of a pianet—the overtly western scales inherent in the source materials prevent the music from sounding like some tribal ethnic gloss. We are instead in a landscape of workshops and tinkers—obviously not tinkerers—with the sense of mallets falling near and far in epicyclic rounds. The percussive character of the music boxes come across as individually distinct as fingerprints, at times reaching ensemble depth, at others solo clarity, but not always staccato. Through manipulation not every envelope jumps from nothing to zero dB all at once. The contrasts of softer and harder attacks—overlapping in agreeable then disagreeable pitches and patterns, in and out of phase, moire, and relaxed predictability, harmonies and durations predetermined and rearranged—makes Solo Traveler’s instrumental pieces a sort of nineteenth century mechanical extrapolation analogous to the digital ingeniousness of Henke’s Layering Buddha: machine music made human by reevaluation, reinterpretation, and restatement. The exception to an overall mood of metallic bliss is the title piece. "Solo Traveler," for five voices and five music boxes. The vocal work, performed by Dare to Breathe, words by Cynthia Nadelman, is a difficult piece, sounding at times like medieval polyphony then shifting to the more abstract tonalities of Ligeti. How the vocal passages were determined and integrated with the music box elements would make for an interesting story, and as an exercise in reconciling two vastly different forms into a single piece of music is no small task. But in the breadth of its nearly 16 minutes, the overall feeling is mostly one of hard work for composer, performer and listener, and consequently lacks the intuitive accessibility of the strictly instrumental pieces. However, yet another resolution in the ongoing search for new methods of originating compositions. Great cover, by the way.